Guilt and resentment seem to be caused by what happened, but they're not. They are states of mind and are created by how we relate to what happened. This is good news because since we created the guilt and resentment, we can release it. Use this article to learn how. Guilt is very destructive. When you have guilt, you reinforce the childhood hurt of feeling worthless, not good enough, not worth loving, or whatever your issue is. You lose confidence and self-respect. You feel undeserving and hold yourself back. Guilt causes all sorts of suffering, but fortunately, it’s something that is relatively easy to heal. The key to releasing guilt is to recognize that we all go through life doing the best we can with a very limited awareness and a very limited ability. To see this in your life, select a guilt that you would like to be free of. Then go back in time to the moment you made your mistake. Didn’t you have a very particular state of mind? Didn’t you see life in a very particular way? Didn’t you act totally consistent with this limited awareness? Now notice what would have happened if you knew then what you know today. You would have handled your situation in a very different way. But you didn’t know then what you know today. You only knew what you knew. Even if you thought you knew, you didn’t know it enough to change your actions. You certainly didn’t know the consequences like you do now. So here is the big question: are you willing to forgive yourself for not knowing and for not being wiser and more aware? You might as well. If you look, you were doing the very best you could with the very limited awareness that you had at the time. So forgive yourself. Forgive yourself for not being wiser and more aware. Forgive yourself for acting totally consistent with your limited ability and forgive yourself for any damage that may have been caused by your actions. Making mistakes is part of the human process. This is how we learn. Every time you make a mistake, you learn a little more about life. You become wiser and more aware. So forgive yourself and allow yourself to be human. It is possible to totally release all guilt in a moment. Sometimes it takes longer. Sometimes you need to release it over time by your declaration, “I forgive myself.” Every time the guilt comes up, forgive yourself again. Eventually, the guilt stops coming back. If you have trouble releasing a guilt, your actions have triggered the childhood hurt of being worthless, not good enough or some other core issue. Heal this hurt and the guilt will disappear. When you resent, a major part of you closes down. You become bitter and less able to express your love. You lose aliveness and joy for life. Your walls of protection get stronger and you become more defensive in your other relationships. Letting go of a resentment is not for the benefit of the other person. It’s for you. When you let go of a resentment, your restore both your peace of mind and your effectiveness. Resentment is a subconscious defensive mechanism. It’s a forceful blaming. “He’s the problem. Not me.” We put the spotlight on the other person so we don’t have to look at ourselves. If we looked at ourselves, we would have to feel the hurt of being worthless, not worth loving, or whatever our core issue is. It’s not the truth that we are this way. It’s just an old hurt, but it’s a hurt that we will do almost anything to avoid feeling. In an automatic, subconscious attempt to avoid this hurt, we blame and resent. The first step in letting go of a resentment is to dive into the hurt. Feel it deliberately and purposefully. Let it come and let it go. Feel the hurt of what happened and the deeper hurt of your core issue. As you do this, the hurt loses power and the need for the resentment disappears. The next step in letting go of a resentment is to notice that the other person is doing the very best he or she can with that person’s very limited ability. If the person was wiser and more aware, the person would be able to act in a very different way. But the person isn’t wiser and more aware. That person is the way that person is. So, are you willing to forgive the person for not being wiser and more aware? Are you willing to forgive the person for acting totally consistent with his or her extremely limited ability? Isn’t that person doing the very best that person can with his or her limited awareness? Are you now willing to forgive the person for whatever damage the person caused? Remember, forgiveness is not for the other person. It’s for you. It’s also a choice. Let go of your resentment because you choose to. If forgiving is difficult, you are avoiding the hurt of a core issue. The best way to be free of a resentment is to schedule an appointment with Bill Ferguson. 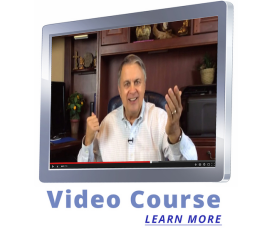 The video course can also walk you through the healing process.